Can't decide what you want to drink? 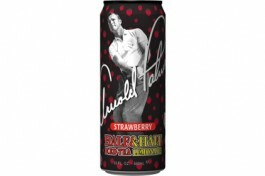 Then Arizona Half & Half drinks are something you'd like! The cans contain a mix of 50% fresh iced tea and 50% Strawberry lemonade. The best of both worlds! PREMIUM BLACK TEA USING FILTERED WATER, HIGH FRUCTOSE CORN SYRUP (GLUCOSE-FRUCTOSE SYRUP), LEMON JUICE FROM CONCENTRATE, PEAR JUICE FROM CONCENTRATE, STRAWBERRY PUREE, NATURAL FLAVORS, MALIC ACID, CITRIC ACID, ASCORBIC ACID (VITAMIN C), SUCRALOSE (SPLENDA® BRAND), ACESULFAME POTASSIUM.